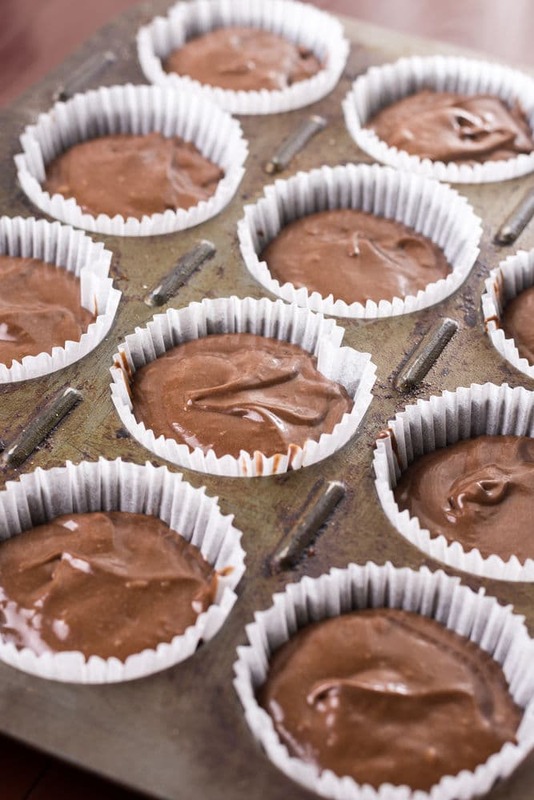 These easy vegan chocolate cupcakes don’t require any unusual ingredients! They’re quick, easy and so moist and delicious that nobody would guess they’re vegan! People are often worried about baking vegan desserts. They seem to think that you’ll need unusual ingredients (like chia and flax) or that the results will be inferior. WRONG! 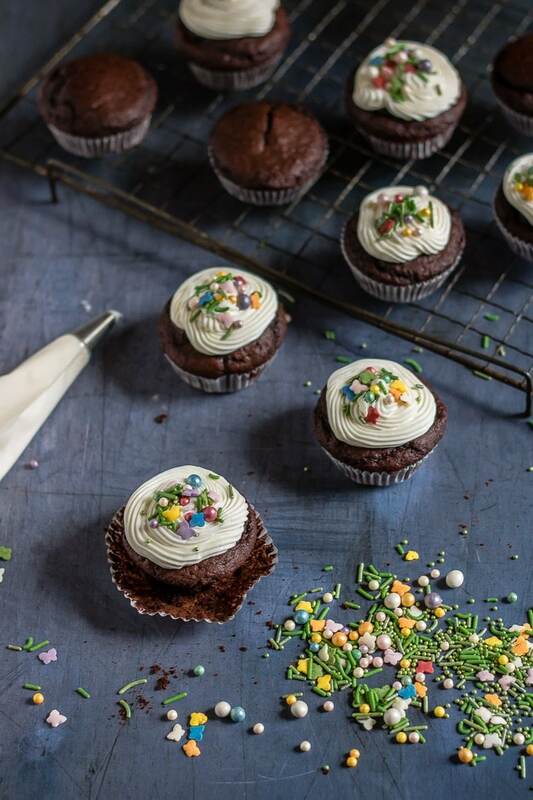 These vegan cupcakes show that you can very easily whip up a batch of vegan cupcakes and they’ll taste every bit as delicious. They’re moist, fluffy and full of decadent chocolate flavour. I’ve topped them with vegan vanilla frosting and pretty vegan sprinkles! Rather than use chia or flax in these cupcakes, I’ve used store cupboard ingredients. They make moist and chocolaty cupcakes that taste absolutely delicious. Step 3 – Mix to combine but don’t over mix. Step 4: Spoon into the prepared muffin tray and bake for 15-20 minutes. Step 5: Spoon into a piping bag and pipe onto the cooled cupcakes. 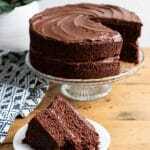 If you’re looking for other easy vegan dessert recipes, you must try my vegan chocolate cake – SOOOO many of you have made it and loved it. I love looking at your recreations on Instagram and other social media. 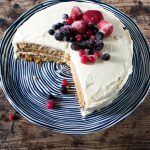 My vanilla vegan birthday cake is also hugely popular with you lovely readers! You’ll also love my vegan Victoria Sponge and Vegan Lemon Cake. 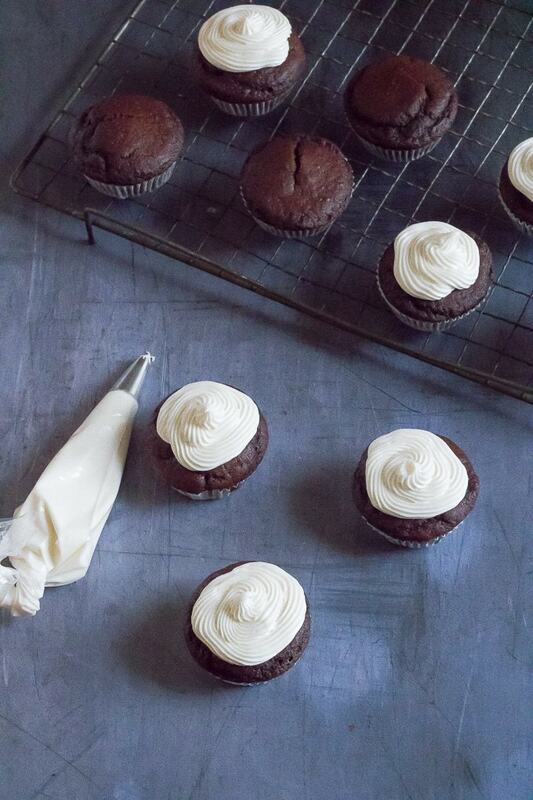 You don't need any unusual ingredients for these easy vegan chocolate cupcakes. They're moist, fluffy and full of decadent chocolate flavour. Preheat oven to 180C / 350F. Line a muffin tray with paper liners. Stir the lemon juice into the milk to sour it and set aside. 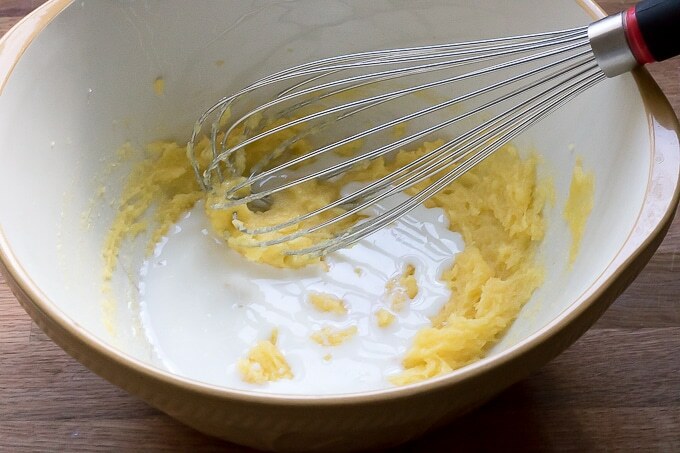 In a large bowl, whisk the melted butter and sugar until well combined. Stir in the milk mixture and the vanilla. 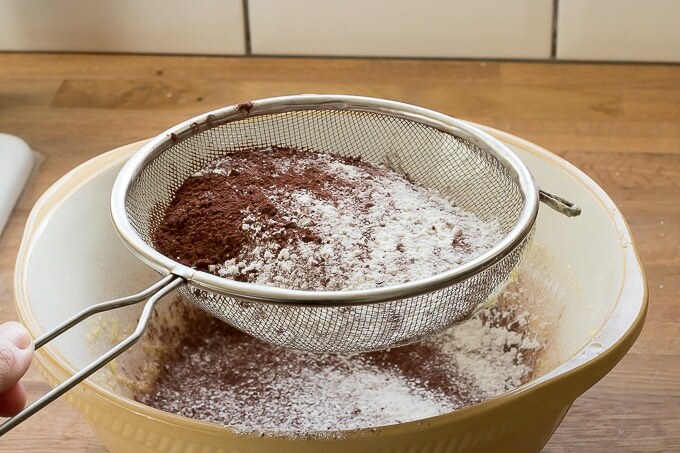 Sift in the flour, baking powder and cocoa and mix to combine. Spoon the mixture into the prepared muffin tray to ¾ full. Bake for 15-20 minutes until risen and an inserted skewer comes out clean. Allow to cool in the tray for 5 minutes, then transfer to a wire rack to cool. 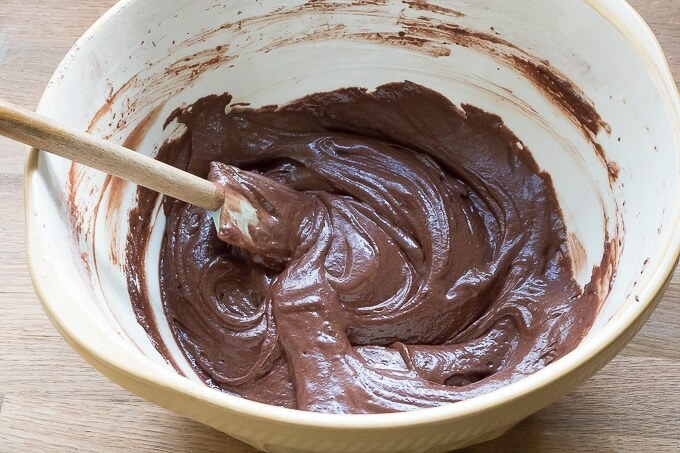 Meanwhile, for the icing, beat the butter, icing sugar, vanilla and and 1 tablespoon of milk until thick and smooth. If the mixture is too thick, add another tablespoon of milk. If it’s too thin, add more icing sugar. 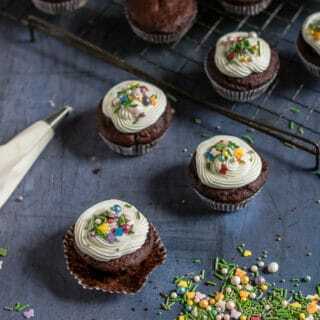 Spoon the icing into a piping bag and decorate the completely cooled cupcakes as desired. I made these for a vegan party. They were better than any cupcake I’ve had, and so simple to make. What kind of “dairy-free milk” can be used? Hi, you can use soy, almond, oat, rice etc… I hope you enjoy the cupcakes! Thank you soo much for this recipe!! I made some for my friends 21st, and doubled the recipe. I admit I was doubtful that the recipe would work for me, as the last vegan cupcakes recipe I tried did not work so well. However, I decided to give this one a go, as I’ve tried your red lentil Dahl and loved it (it’s now a staple in my home!) These turned out to be amazing. They were fluffy, moist, with just the right amount sweetness and chocolate flavour. And they were so simple to make! Everyone enjoyed them. Cheers! I made these for a friends birthday and I can’t believe how delicious they are! This was the 3rd recipe I tried (the others were SO unsuccessful) and I’m really pleased with how they came out. Yes, it’s fine to freeze them (un-frosted)! Can you use Apple cider vinegar instead of lemon juice? I completely forgot the lemon juice!! Yes! It will work fine with vinegar too. I hope you enjoy the cupcakes Isabel! These are delicious! Thank you so much for sharing this recipe. I didn’t even have to go out and buy the ingredients. I had it all in my cupboard/fridge. I also love that you put the U.K. measures too. Much love. 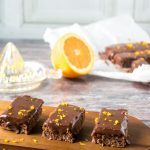 These look so delicious, even better that they are vegan! 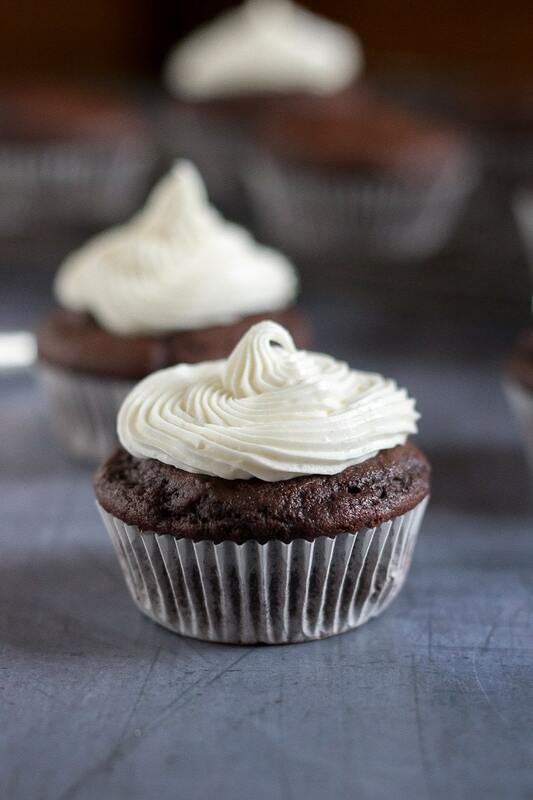 These have got to be the lightest, fluffiest vegan chocolate cupcakes I’ve ever seen! They’re gorgeous! A great recipe. I tried this over the weekend for a family member who is vegan and everyone loved the buns I made. 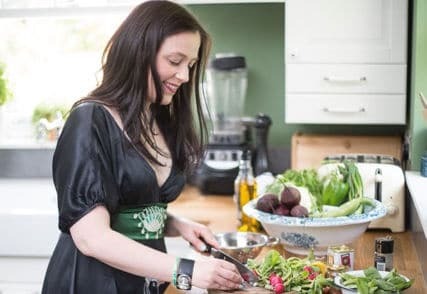 Great recipe, I would recommend this to anyone! They are so cute, love how they don’t have any hard to find ingredients in them. That’s often such an off-putting aspect of vegan baking. 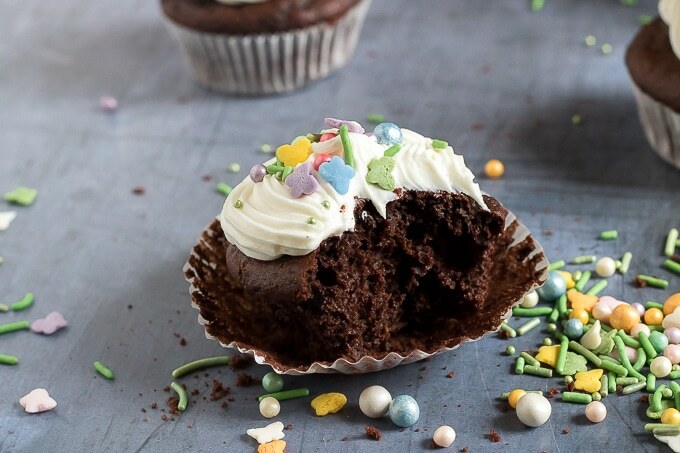 Chocolate cupcakes are always a hit. I love those sprinkles. I actually just saw them in a store here….great cause I thought you could only order them online. Hubby would love these little treats with his tea for sure. Kate, these are gorgeous and I can tell by the recipe (and photo) that they’re moist and delicious. I bet no one even knows they’re vegan. Nice job…thanks for the recipe! I’ll be sharing this everywhere ???? Oooh yes! Thanks for making a recipe for vegan cupcakes without chia or flax! I know they’re healthy but they’re so costly and give cakes a sorta weird texture. I am craving some chocolate cupcakes! I love how you made these vegan! 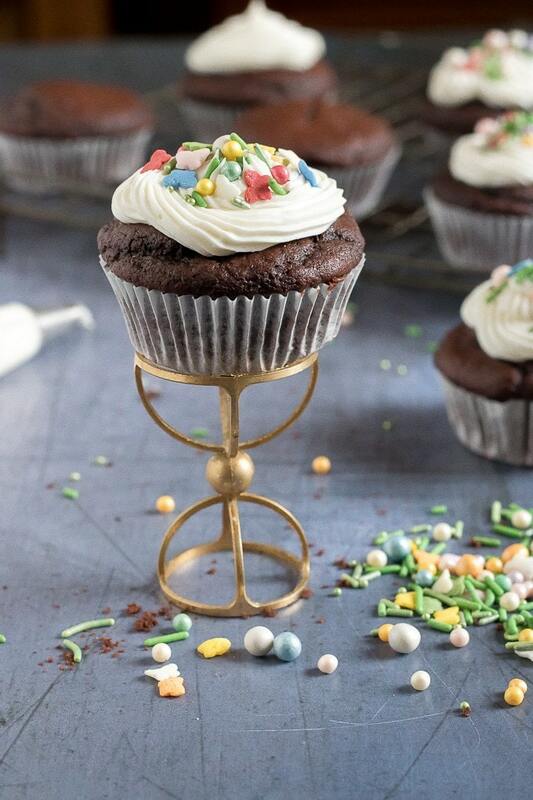 These are so elegant without the sprinkles, and so much fun with them ~ what a versatile dessert!